Rick and Morty Umbrella: Portal Jump | Nerd Much? With Adult Swim recently ordering another whopping 70 episodes of Rick and Morty a surge of related merchandise is inevitable. Get ahead of the crowds and snag yourself an awesome and incredibly useful Rick and Morty umbrella. Any mad scientist, or crazy grandpa, can acknowledge the usefulness of truly being properly prepared. Well, nothing ruins a day like an unexpected rainstorm, so be ready. What better way to fend off rainstorms than with this Rick and Morty portal jump umbrella — new from Thinkgeek. 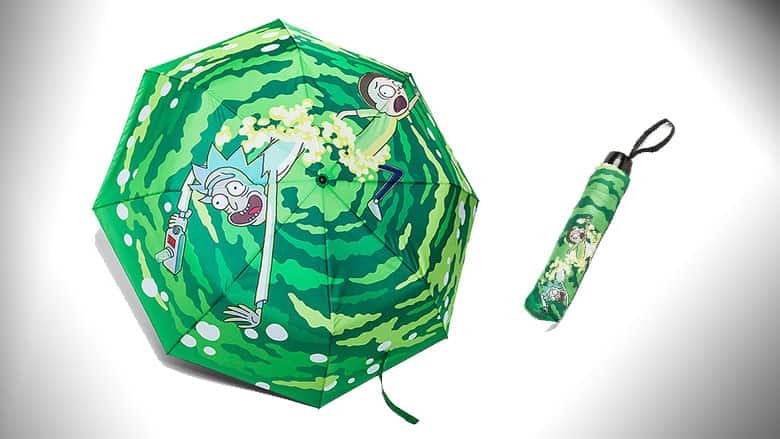 This officially licensed Rick and Morty merchandise is sure to keep you dry while making others wonder where Rick and Morty are headed this time. Featuring Rick and Morty caught mid portal jump, the expression on their faces is sure to turn heads. This pop-up umbrella was designed to stow away neatly for any adventure, and even comes with a matching carrying sleeve. A Wrist strap with a hook and loop closure ensure you won’t lose this umbrella while you portal jump to your next great adventure. Between the carrying sleeve and wrist strap you will be beyond well equipped the next time those storm clouds roll in. Measuring 32 inches in diameter when fully open and 22 inches long, it is the perfect size to navigate around the galaxy while still staying dry. At a price like 19.99, stock up and keep one wherever you may need it, car, home, office, or anywhere. In stock now at Thinkgeek. Buy the Rick and Morty Portal Jump Umbrella here.